Heading Down the Great Divide Part 3 Mexico! 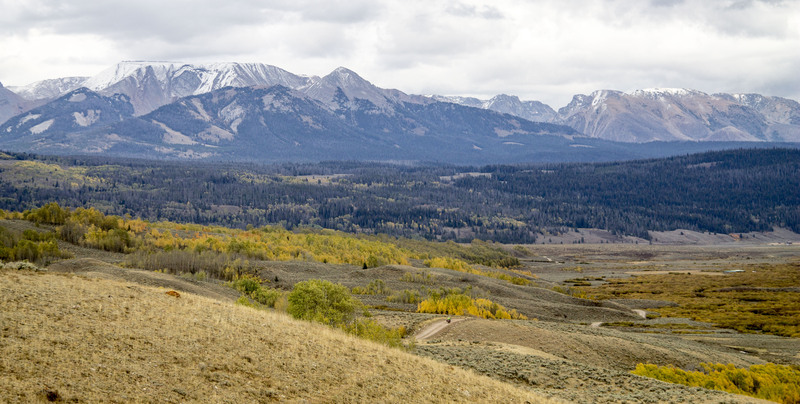 Molly Nelson and I left Banff, Alberta at the beginning of September and headed down the Great Divide bicycle trail, on a Yamaha TW200 and a Kawasaki 250 Super Sherpa. 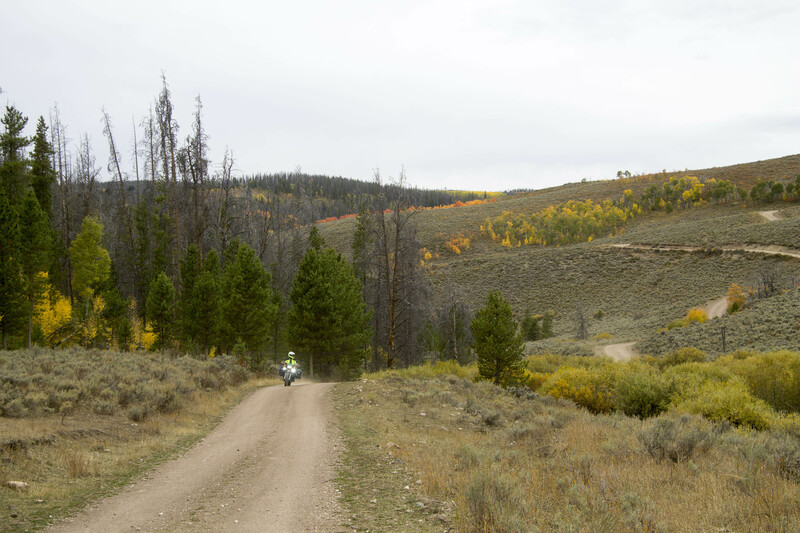 We planned to get to Mexico by the end of September, and meet our Yamaha XT 250-riding friend Michelle Lamphere from South Dakota, to ride with her for 10 days from Montana to Aspen Alley, Wyoming. 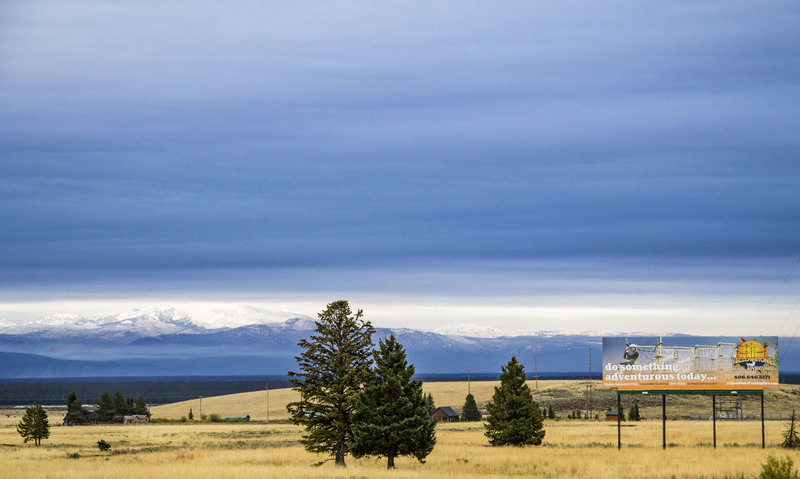 Read about the journey to Montana here. When Molly and I agreed to do this trip, I didn’t have a dual-sport bike, camping gear, riding gear, or cash for any of the above. But I made the decision to go and life conspired to make it all happen. Our intrepid riders warm their hands as best they can. There were chilly times on the ride south, but always good times. 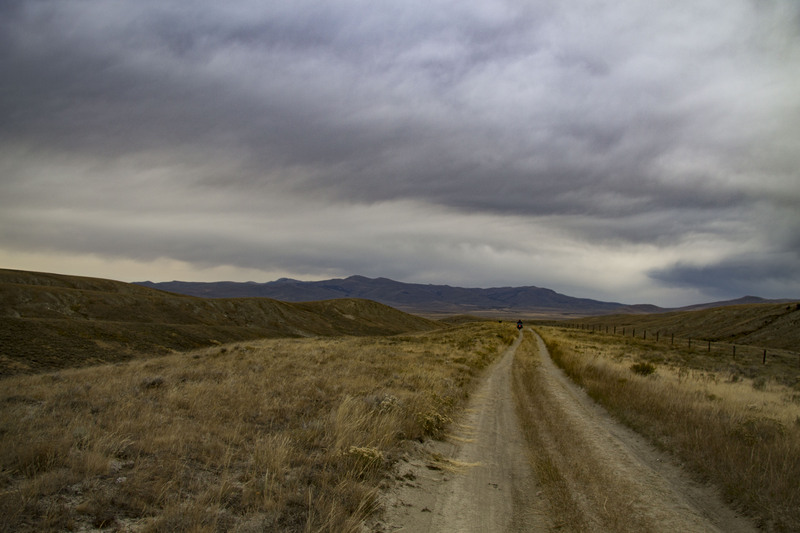 In Bannack, Montana, Michelle arrived on her Yamaha XT 250. Michelle knows how to pack light after spending two years riding the Americas. It was cold as we rode the Bannack Road and passed amazing views as the sun warmed the landscape, creating dusty roads once again. The Red Rock Pass, elevation 7,120 feet, goes across to Idaho and the Targhee National Forest. It was so cold that we stopped every 10 minutes or so to put our hands on the bike engine to warm up. It was a challenge we started to enjoy: pushing ourselves to see how far we could go before numbness forced another stop. Feeling cold yet? Just put your visor down and hunch a bit more and you’ll be fine. It began to rain, so we pulled over at a coffee shop/gas station. The rain changed to snow, so we split the cost, after Michelle, a hotel manager herself, bartered a lower price at the local Super-8 motel. Like the sign says, do something adventurous today. Like take off to Mexico. We arrived at Meade Ranch, near Jackson Hole, to stay with a friend of Molly’s after a beautiful ride through the mountains. Kate was a gracious hostess, and treated us to her upscale guest house where we were once again spoiled with a luxurious setting and beautiful home. Our fine steeds spent the night in their own horse stalls in a heated barn. 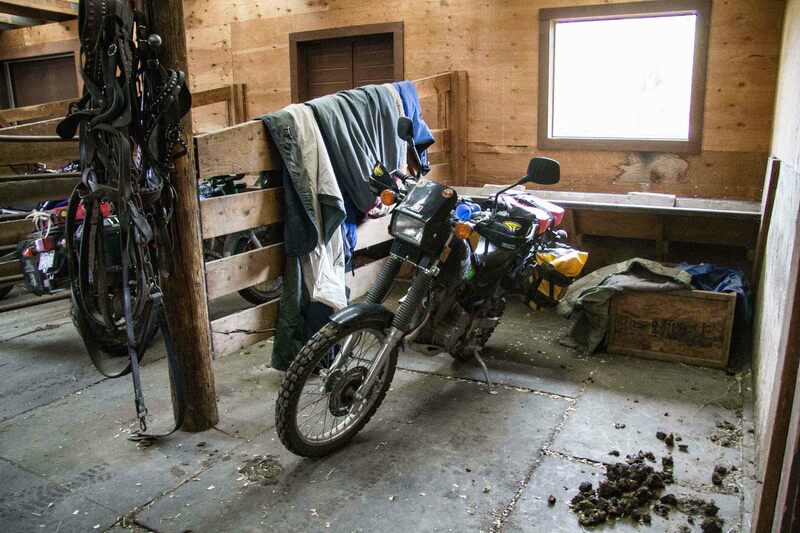 Tammy’s bike is forced to share a stall with a big pile of horse crap. At least, we hope it’s horse crap. 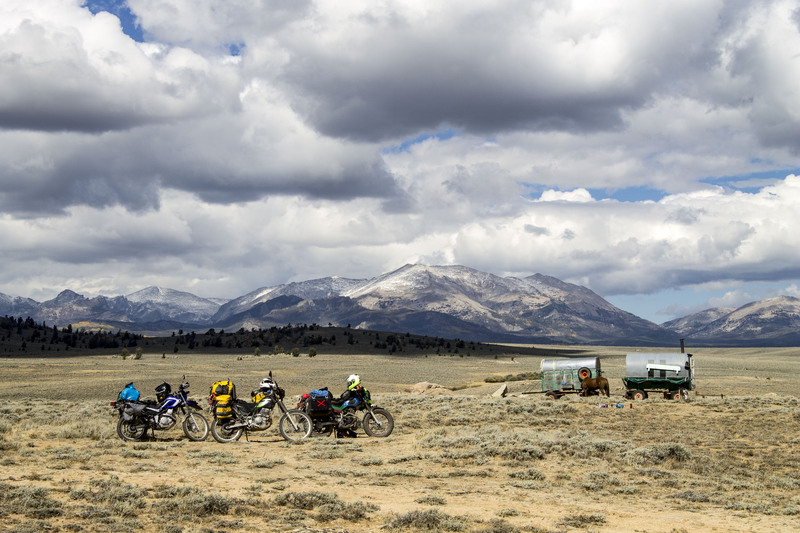 When we left, we spent the better part of the day riding dirt, mud, gravel, washouts, steep ascents and descents; always surrounded by breathtaking scenery, wildlife and people. We were thrilled our bikes were holding up, and grateful for our warm gear. Herds of antelope bounded by. 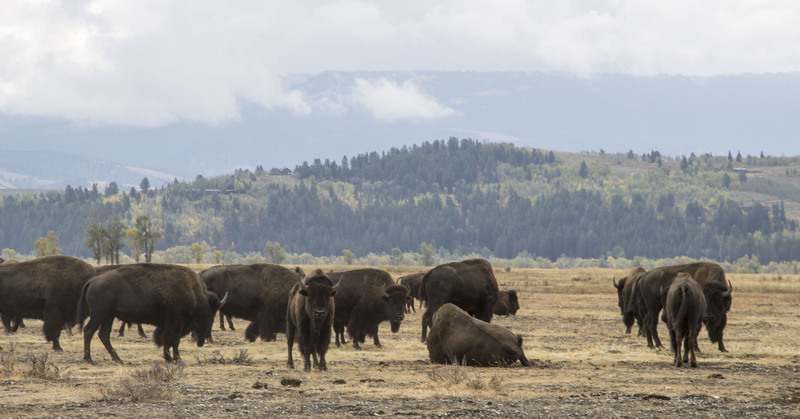 We were romanced by the call of a herd of buffalo. Molly and Michelle, both farm girls, warned me of the dangers of getting too close, as buffalo are large, unpredictable, aggressive creatures, especially in rutting season. We paused for two trucks parked in the middle of a farm road – there were photographers standing in the back, studying the massive prairie creatures. A huge alpha male watched our bikes, apparently annoyed by the sound they were making. (Molly’s bike had a gas drip, so she had to either leave it running, or shut the gas off.) I took the opportunity to take some photos, feeling way too close for comfort, but the trucks afforded some protection if the herd should decide to stampede. A couple of the larger males started attacking each other, and the alpha male started heading for us, so we decided to leave. A “saloon” owner, Susan, in Kendal Creek, offered us a cabin for the night, at whatever rate fit our budget. Another warm and cozy night. And then, there are moments with pauses like this. Makes all the rain and cold hands worthwhile. We stopped on a trail somewhere near an old shepherd’s wagon, and saw its owner washing his clothes in a bucket on the front step. 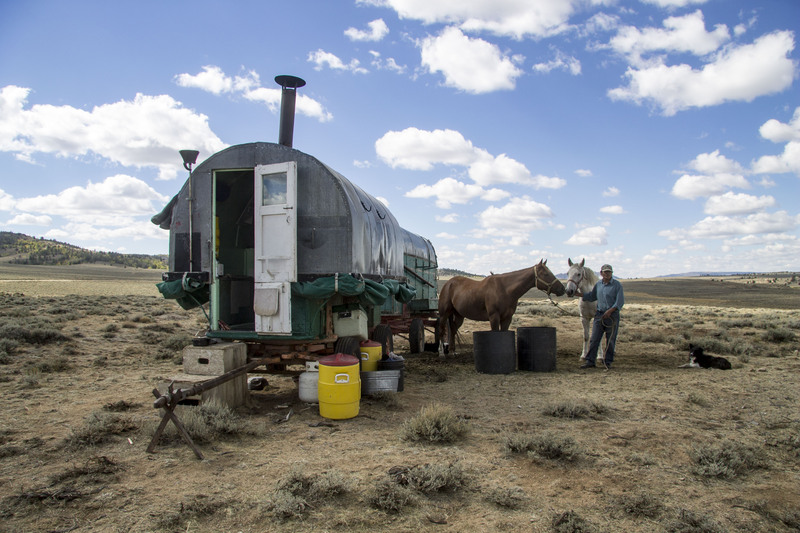 Molly always wants to meet people and get their story, and Michelle’s grandparents lived in a shepherd’s wagon like this after they were married, so we decided to investigate. Somewhere out there are a thousand sheep, waiting to be serenaded in Spanish. The man greeted us warmly in Spanish. Michelle responded en español and gave a short version of the story of our trip. We invited ourselves to lunch and started making a curry that Michelle had been promising us for days. Living in his tiny wagon, Hernando has been shepherding 1,000 sheep for the past two years, though he has a wife and five children in Peru. He’s been sick and feels older than his 53 years. He told us he’s a musician, so miming air guitar, Molly asked him what instrument he played, and he laughed, telling Michelle he played saxophone. We begged him to play us a tune. Hernando gets ready to serenade Tammy with the same dulcet tones he uses on the sheep. 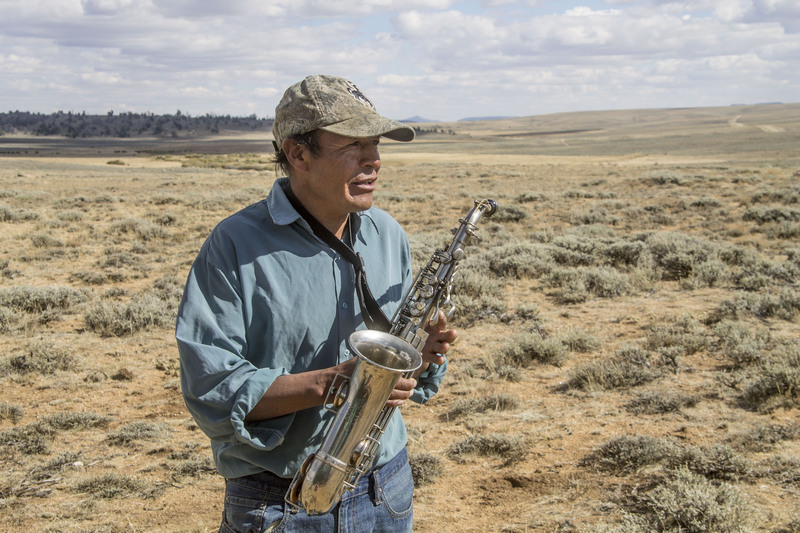 He stood happily in the wind outside his wagon and played El Condor Pasa on his Italian saxophone – I’d rather be a hammer than a nail, yes, I would – with horses, dogs and three motorcyclists as his rapt audience. I shed tears whenever I remember this moment. When we said goodbye, we all pulled out some extra food and left him with oats, rice, muesli, fruit and even some moose jerky from Newfoundland, ending our international encounter. There’s a lot to be said for an easy life, though Hernando’s life, while unfettered, is not easy. Sadly, we said goodbye to Michelle the next day. Molly and I experienced a lot of “rider training” after that. The road was a mess, requiring a lot of concentration and work. We were rewarded when we happened upon a little town with a grocery store and a KOA campground on a beautiful river. The next day we cleaned the bikes and had a professional oil change and checkup. 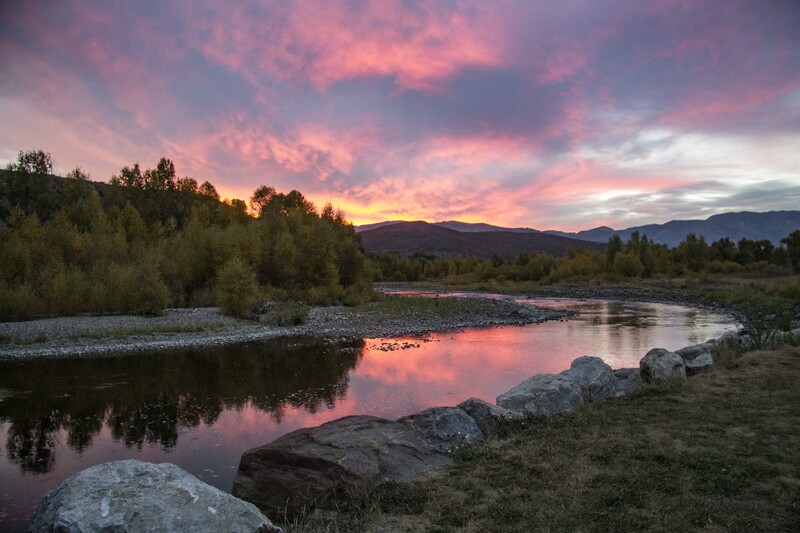 Sunrise over the river at the KOA Campground. We headed through some colourful, meandering mountains. On a couple of twisties that were uneven, one-laned tracks with sharp corners, I’d been hugging the left side of the road, avoiding riding too close to the edge. Going between 20-30 km/h, I was concerned about the steep banks to my right and figured I’d rather crash into the mountain wall than go over the edge if I should confront an oncoming vehicle. Molly was creeping her way on the right cliff-side of the road, more concerned about oncoming traffic. At our next rest stop, we talked about the pros and cons of each method, and decided her method was better: stay on your own side of the road, ride more slowly and keep an eye out for traffic. 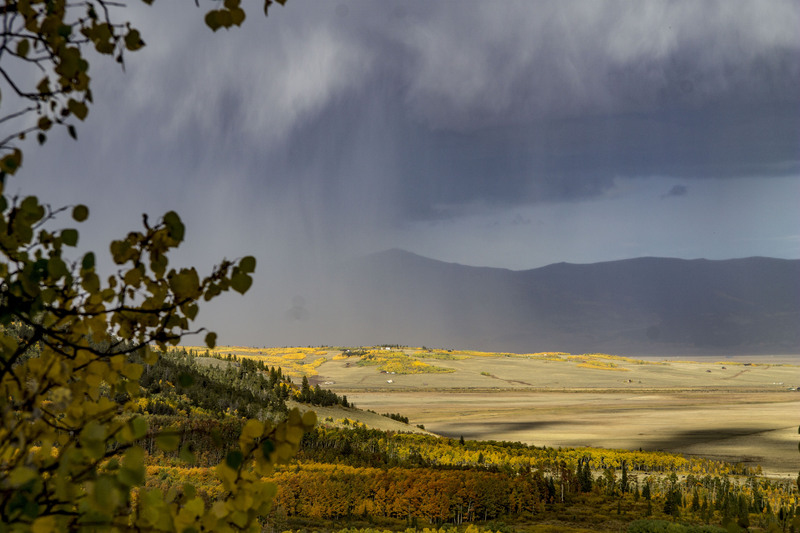 Colorado in the fall is saturated with colour and drama. If I tried to tell you all the stories, you’d be reading for days. Photographs are great replacements for thousands of words. Look very closely and you can see Molly riding on the road, past the colour of the trees. Click on the picture to expand it if you need to. We continued on to Marshal Pass, elevation 10,842 feet, with its breathtaking vistas. 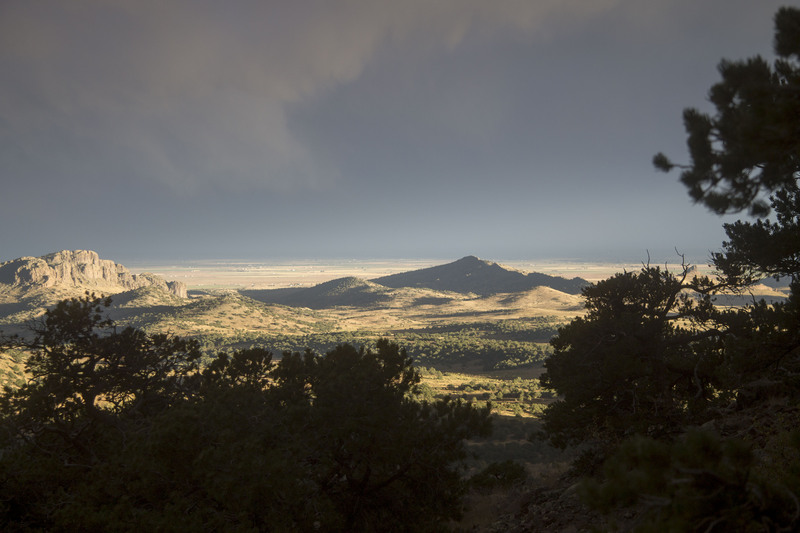 Fortunately, it had become warmer since we entered Colorado, so no warm-up stops were necessary, but after a couple more high passes, it was getting late and we were skirting around a nasty-looking storm. Time to put the rain gear on – it’s going to be wet. We nonchalantly arrived at the next town expecting to buy gas and food and ask directions to a campground. To our disappointment, the single store was not only closed, but for sale. According to our notes, there were several places with accommodations in the area, so we rode on a dirt track toward the addresses we had. For the first time, we got ourselves a bit lost on the back roads. Now, it was getting dark and starting to snow. Don’t let the smooth dirt track fool you. The snow will be falling soon, and the trail will be dark and treacherous. This was a bad state of affairs. 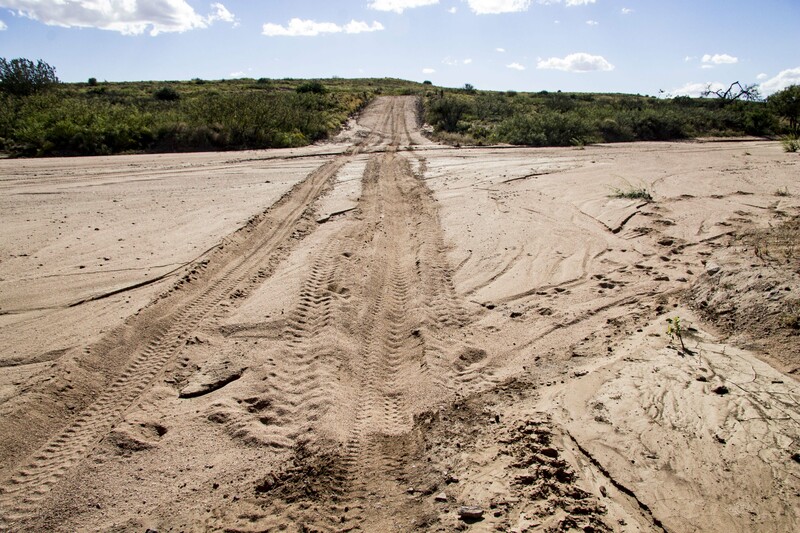 We were looking for decent camping spots along the side of the road, but heading toward the national park; we followed signs to a packed-dirt track where mud ruts had hardened into a rough but rideable surface. The fading light and dark trees made it eerily beautiful inside the park boundaries. We saw a sign that read “Natural Arch”. Molly stopped her bike. I pulled up next to her and said, “Let’s find the arch and camp there.” Of course she was just about to say the same thing. And the arch turned out to be the coolest campsite of them all. 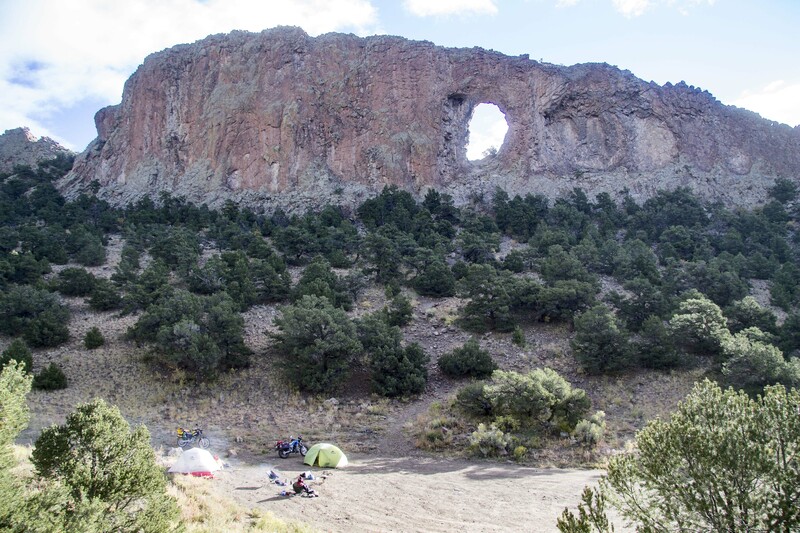 We’ve got to admit, this is a pretty cool place to pitch a tent and spend the night. We just had to see the view from the arch. The climb was difficult, with loose rocks and smooth sheer faces; we stopped and caught our thin-aired breath a few times before finally being rewarded with an incredible vista. The snow stopped and the evening sun was beaming through the thick black clouds on the horizon, lighting up the landscape like a painting. The view from the top of the arch made the climb worthwhile. At the top of the cliff was a pile of neatly-cut firewood. How it got up there is anyone’s guess, but seeing as it was cold and late, we chucked it, piece by piece, down the cliff to the bikes. We felt bad for the poor fellow who was about to impress his love with a romantic fire atop the natural arch, but we were cold enough to justify it. We took our time the next day and headed south towards New Mexico. 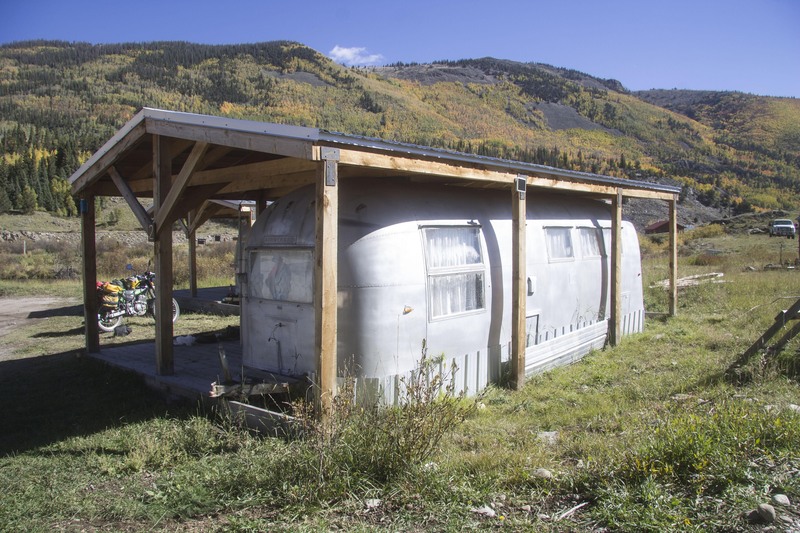 We pulled into Conejos Cabins and booked their last available accommodation: an airstream trailer. At dinner, a couple of generous fishermen ranchers from Texas shared their trout with us. They also shared some great conversation and left us $40 with a note that said to go to a certain restaurant in Taos for dinner on them, which of course, we did. This is also a pretty cool place to spend a night, for so many different reasons. I had been through Taos before, and was invited back this time around to a beautiful house in the hills. We stayed two nights so I could catch up on some work, then headed into the warmth of New Mexico, where the dusty desert calls for swims whenever possible. 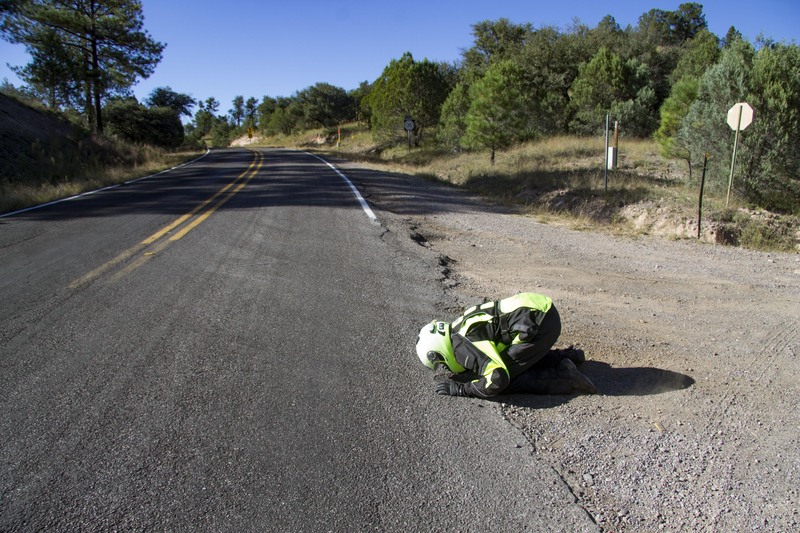 Rocks and loose sand – the curse of motorcyclists everywhere. A walk up the hill and around a sharp corner confirmed it wasn’t getting any better. Not sure whether Molly was going to want to do this or not, I walked back down to see her idling at the base. I recommended we retreat and not spend the day in dangerous conditions. Molly wasn’t quite as confident as usual – she’d learned the previous day that her beloved dog Booger had been killed in a farm accident – and at our age, we both realize when pushing on is foolish and against the whole intention of this trip. Molly concurred. We headed back to take the alternate route. 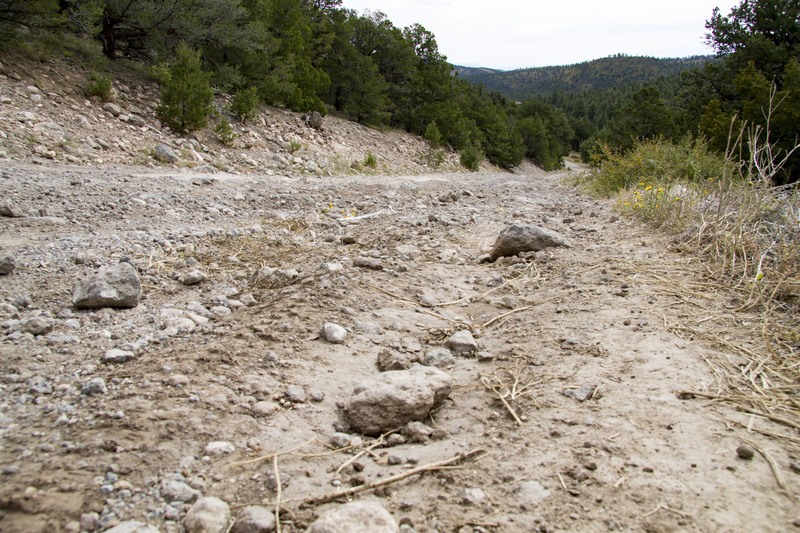 Sometimes, it’s best to just admit you don’t want to ride on a crappy road. Why do it if you don’t have to? 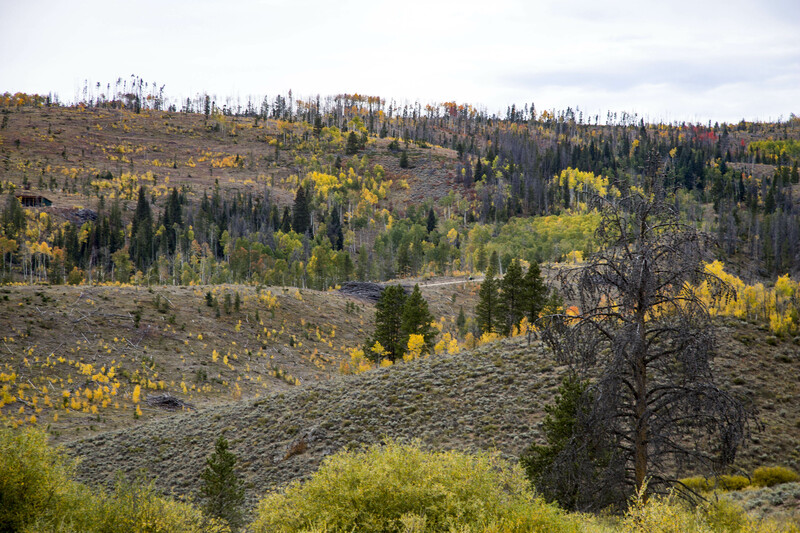 The forest we then rode into was thick old growth, teeming with the sounds of rutting elk. I had never heard the haunting cry of an Elk before. It sounds like the most desperate scream for a mate that I have ever heard. They call it a bugle, but it seems like a frantic, distraught, drawn-out bellow leading to a screech that ends in a series of grunts, and goes on into the night and early morning. The next part of our journey led us along dirty, sandy roads, and thankfully, warm and sunny weather. Very long stretches across the desert required us to use our spare gas cans. At last – sunshine and warmth as the desert draws closer. I’m glad we had a good nap that day. 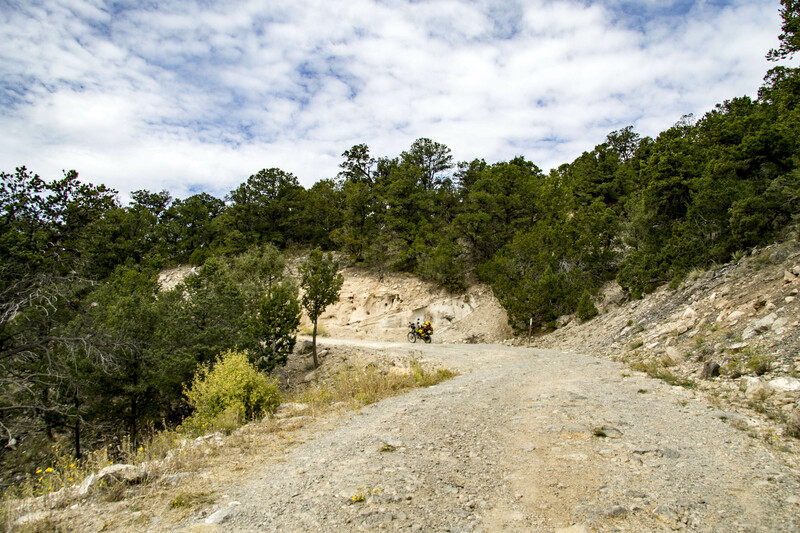 The forested landscape was beautiful of course, but the steep, soft gravel and hairpin turns were not. For most of this trip the trails were devoid of traffic, but this forest road was frequented by big pickup trucks with large horse trailers. At one point, I was forced to skid to an uphill stop and press myself against the bank in order to avoid annihilation. Quite how one kisses the road through a full-face helmet, we’re not sure, but it’s probably the most hygienic option. After kissing the pavement at the end of the dirt road, we realized that this particular stretch was also one of the places where gas is scarce, and we had 40 kilometres worth of gas, and 50 kilometres to go. Luckily, Greg and Lyndsay (@Terradrifting) crested the hill on their small-displacement adventure bikes, Yamaha WR250Rs with big tanks and soft luggage. At the beginning of a world tour, they were happy to give us their spare gas and chat about the route until we carried on to Silver City. I look forward to running into them again someday. 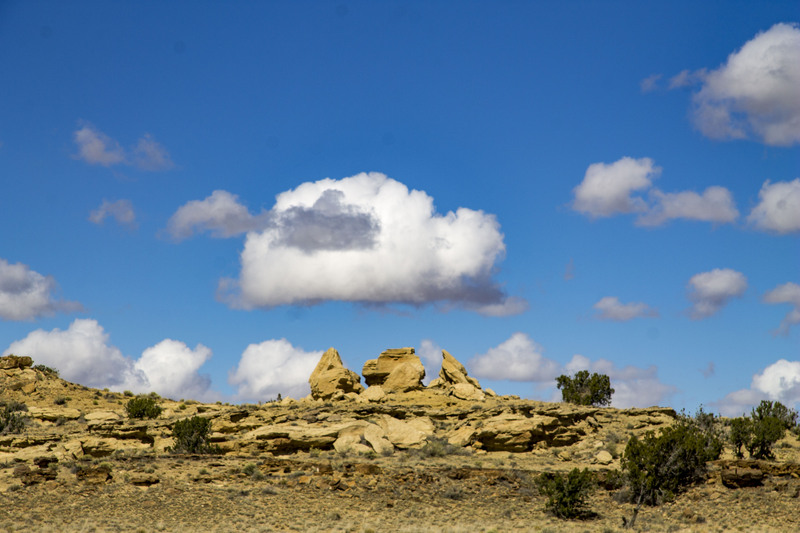 Another piece of the trail that involves fuel planning is the route from Silver City to Antelope Wells. At 250 kilometres, give or take, our tanks and extra gas cans would get us there, but not back. After careful consideration, we decided to take the trail to Hachita, then the road to Lordsburg, where we’d find the closest gas station to fill up before heading to Antelope Wells. Uh oh – remember the golden rule to add some throttle and release your grip on the bars to take the weight off the front wheel. For 100 kilometres. The track to Hachita started out like many of the tracks: a mixture of sand and gravel, that quickly turned into deep soft sand, and which neither of us were experienced with riding. We stopped and had a chat about our fears, but this time, instead of turning back and going for the tarmac, we decided to see this as a gift – a “Sand School” if you may. It’s true what they say about throttle: when you feel like you are losing control, a little throttle straightens you up. By the time we got to the tarmac, we’d spent a full day riding 150 km, about 100 of them in soft sand. Instead of continuing on for gas that night, we decided to head east the short distance to Hachita. There wouldn’t be a campground or gas station, but we were fatigued and it was getting late. Pulling into Hachita, a tiny town of around 30 people, we stopped to talk to a woman who was in her yard with her family, feeding a horse. She made a quick telephone call and minutes later, we met a man down the street at the community centre. He gave us the key code to the building, turned on the hot water heater and left us with a couple of gallons of gas so we could go straight to Antelope Wells in the morning. Who needs a namby-pamby hotel when you can stay in a community centre, and sleep next to your bike? We horsed around in the community centre and rode our bikes inside the building. It was nice to be able to clean our gear and reorganize for the final leg of our journey without getting sand in everything. 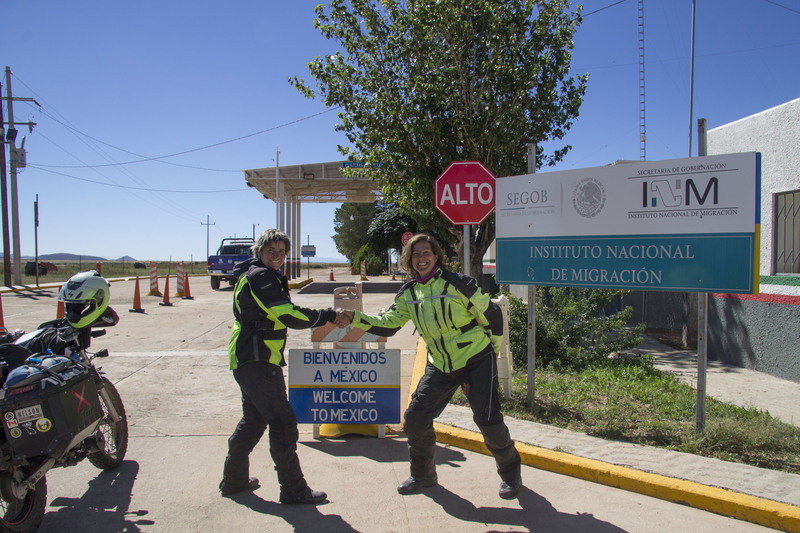 In the morning, we rode a long, straight, lonely road to the Mexico border, and were pleasantly surprised by the friendliness of the Mexican border patrol. We got our passports stamped and the guard offered to take our picture. Just about to cross the border, and photographic proof thanks to a friendly Mexican border guard. Note the lack of a wall. We followed the rutted dirt road for a few kilometres, then turned around and headed back through the not-so-polite U.S. border. To give them credit, I think they were breaking in a new guard, and Molly did say it was hard for him to “look tough with braces”. They refused to stamp our passports and would not let us take pictures. We solemnly made our way back to Hachita, and stopped back at the community centre, still in possession of the lock code. A couple of guys on bicycles also arrived and took our photos before we went separate ways: Molly headed west to meet up with a friend in Utah, and I headed east, to house-sit in North Carolina. 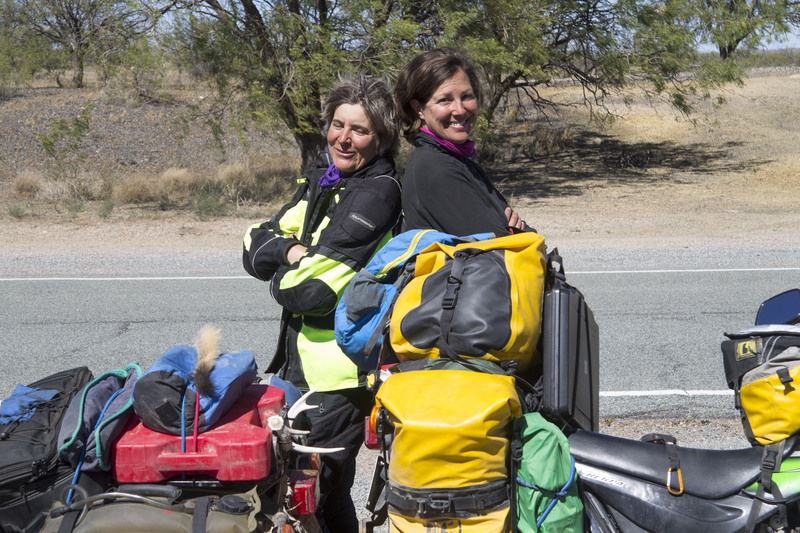 Molly on the left, and Tammy on the right, pose for a final photo in Hachita before going their separate ways. It was incredibly emotional to part ways like that, and I have to admit I was pretty stressed about having to go back to my “other” life. I was on a deadline and had to be in N.C. within the week to work on a project. On the evening of October 4, I left Molly in Hachita, and on October 9 at 5pm, I rolled into a driveway in the foothills of North Carolina. More than 2,800 kms in 5 days, on a 250cc Super Sherpa. How did I come out of all this? The single most important aspect of any kind of travel is the people: the genuine and generous people you meet along the way, both rich and poor, who all just want to live a happy fulfilling life, feed their families and carry on their traditions. They want opportunity and a safe environment for their children, and they want to be able to trust their government. 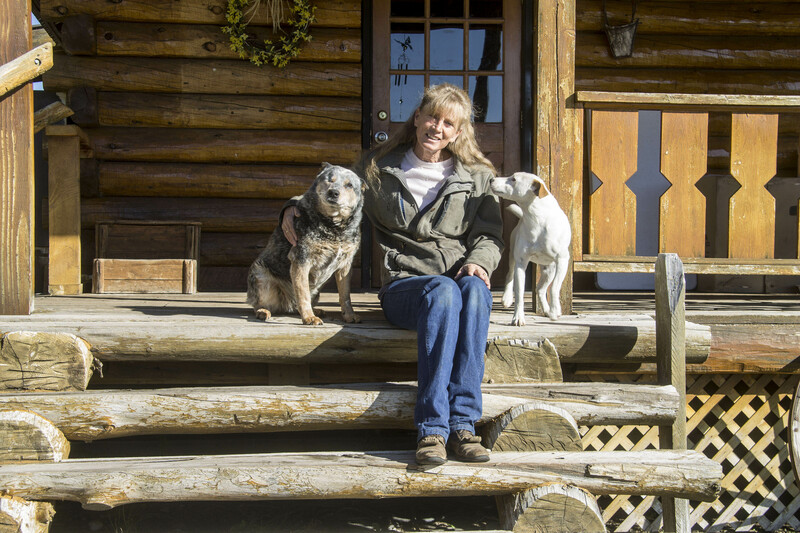 Susan, the saloon owner back at Kendal Creek near the buffalo herd, with a couple of friends. Lack of exposure to differing points of view inhibits our ability to be empathetic. If you have strong political views, plan your next motorcycle trip so you’ll be around those with an opposite political stance. 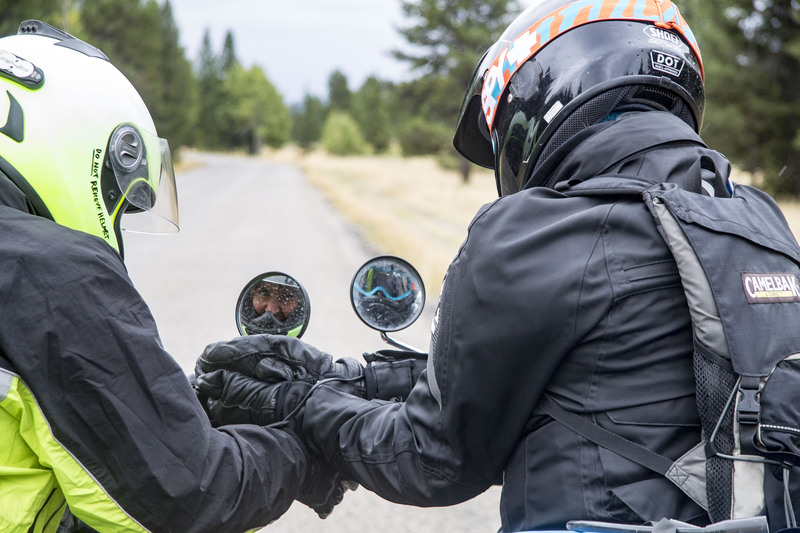 Motorcycle camping on routes like the Continental Divide also gives a daily connection with nature. Shinrin-yoku is a Japanese term that loosely translates to “forest bathing”. Studies show lowered stress hormones, decreased inflammation, improved immune function and a positive mental outlook after time in green space. I slept better, woke up after every night on a camping mattress without any aches or pains, and was healthy and happy the whole time. I hope this story inspires you to follow your dreams, and get out and ride whatever trip you have wanted to do. It doesn’t matter if it’s an overnighter at the local park, or an around the world tour – your health and happiness will be all the better for it. Here’s another one to look closely at, and you’ll see Molly riding away from the camera. We rode treacherous passes under daunting conditions, but we never dropped our bikes, had a flat, or ran out of gas, food or water. Once, Molly’s Ratty Pigeon bike leaned over in a deep rut, but the rut was too deep for the bike to fall over. We didn’t use a GPS, just old school maps and a smartphone to help with our current location, and for trickier turns. We had our oil changed halfway and regularly cleaned and lubricated our chains. We used non-ethanol gas whenever we could, and used our 10-litre gas can contents regularly to avoid oxidized gas. Molly fuels up her little Yamaha, far from a gas station. We camped most of the trip, and cooked our own food using a Biolite stove and a Kelly Kettle. We ate real food: oatmeal, fruit, rice, veggies, greens, and Molly’s favourite, lamb. We had Hubba Bubba tents, compact air mattresses, and sleeping bags rated to below freezing. We drank and ate out of the pots we cooked in. Much of the camping was primitive, so no toilets, showers or water. The Katadyn Hiker Pro water filter was a necessity. Stove fuel and twigs were abundant, and amazing camping spots with well-used fire pits often popped up from out of nowhere. The weather was cold, but we were warm and comfortable at night. We lit campfires on cold evenings and mornings to warm up boots and gear. We rolled the bikes and moved the tents into the morning sun to burn off frost. In bear country, we hung food and toiletries from trees away from our tents, and kept the fire area clear of attractants. It was an unusually early fall in the North, and we met very few other riders or cyclists along the way. If I were to do it again, I would leave Banff in mid-August, risking a wetter and muddier ride in the south, but ensuring warmer weather.